This audiobook is a stand-alone story. 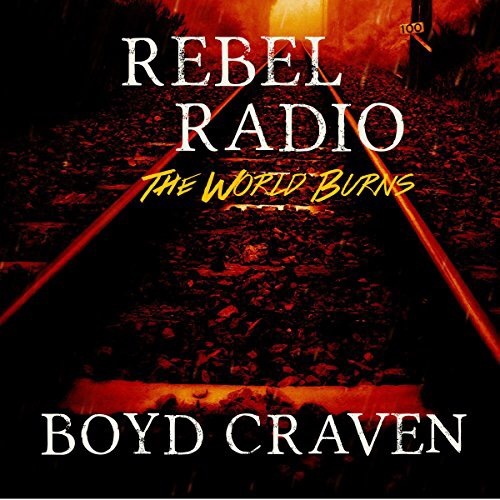 It does take place in the world of Boyd Craven III’s “The World Burns” saga, but it is the unnecessary to have any knowledge of those books to understand or enjoy “Rebel Radio”. An EMP (Electromagnetic Pulse) has destroyed all electronic devices and the world has been sent back to a time before electricity. This is a fairly common storyline in the post-apocalyptic genre. There is some of the typical hunt for supplies and shelter going on in this audiobook, however there is much less of this than one would expect. This is a story first and foremost about people. Yes, the setting is post-apocalyptic, but that is really just the backdrop to the actual tale. This book is written from two different points of view. Each chapter is either told from Don’s perspective or from Z’s perspective. Don is male and around 33 years of age and Z is a 23 year old female. The narrator does an incredible job as the voice of Don; the depressed, alcoholic, but I found it both strange and disconcerting that the same voice also narrated the chapters that were written from Z’s perspective. I would have preferred to hear two different narrators (one male & one female) so that it would always be clear whose perspective that chapter was being told from. Boyd Craven III has created amazingly realistic and completely believable characters. It is those characters that drive the story. Ben is a severely depressed, suicidal alcoholic and was this way even before the EMP. He decides each morning whether or not he is going to kill himself that day. Z is a gamer girl who has spent most of her recent years living life through her computer screen. She now realizes that no matter how amazing she was at playing (and winning) post-apocalyptic video games, that those skills are completely useless in her new reality. When the two misfits cross paths they each need to decide how to proceed with their own survival, and whether or not to team up and help each other, especially considering that their individual trust and faith in humanity is in short supply. I was drawn in to the audiobook and listened to it in a single session. It’s length of only 4 hours and 38 minutes made this easy to do. I do not want to reveal any spoilers, but I will say that I recommend this audiobook very highly. Boyd Craven III is the author of “The World Burns” Saga as well as “The Scorched Earth” books. He describes himself on his website as a “regular guy”. He owns and works on his own farm and is part of a co-op that sells vegetables at a farmer’s market.